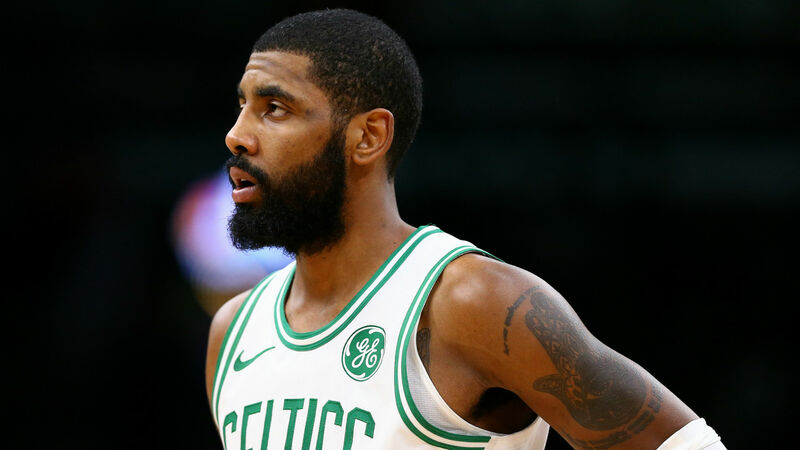 Boston Celtics guard Kyrie Irving labelled free agency speculation generated from a video with Golden State Warriors star Kevin Durant as "bull****". Irving was seen talking to Durant in the tunnel at the NBA All-Star Game in Charlotte last week, prompting rumours the pair could team up with the New York Knicks next season. Both Irving and Durant can become free agents at the end of the current campaign and the pair have been linked to the Knicks. Celtics star Irving was noticeably agitated when answering questions about his discussion with Durant. "It's my life, right?" Irving told reporters on Wednesday. "It's two people talking, having a conversation. If this was the real world, would it be anybody else's business? It's a video of somebody assuming what we're talking about. So why would I care about it? Why are you asking me those type of questions?" "C'mon man, you do it for the likes and clicks, everybody does," Irving added. "Everybody wants to hear me talk like this. Everybody wants to actually talk about bull****. video though? To pour water on [speculation]? Makes no sense. It's not real life. Not real." "That's where we started the conversation, what I do in my life is my business," he continued. "So it's none of yours, none of anybody's business, right? So it's a video of me and one of my best friends talking. And then it turns out to be a dissection of a free agency meeting?" The Celtics have had an up-and-down season and entered the All-Star break fourth in the Eastern Conference with a 37-21 record. Irving addressed the team's inconsistency, telling ESPN: "It's been a trying year for us. We basically have a bunch of young men in our locker room who feel like they're capable of doing a lot more than they're doing. And that's OK, but there's a maturing that you have to have. There's a professionalism that you have to showcase every single day, and that's what the great ones do. "I initially didn't play the minutes I wanted to play. I'm 26 years old, heading into my prime, like, why do I have to wait for anybody? [Terry Rozier] played in the playoffs. He did extremely well. Coming back, that's a natural competition that me and him have. "It is what it is. No one wants to say it, but I will. You know, [Jaylen Brown, Jayson Tatum], all these guys, it's part of their growth. When you have winning in mind, you've gotta understand that. You gotta do what it takes, but you gotta understand your team-mates."